What is the 2019 FIFA U20 World Cup? The 2019 FIFA U20 World Cup will be the 22nd edition of the tournament which is played every two years. It is a football world championship competitions by FIFA and open to national teams featuring male players under 20-years-old. The FIFA U20 World Cup began in 1977 with the first edition held in Tunisia and won by the Soviet Union. The tournament was known as the FIFA World Youth Championship until 2005 when it was rebranded as the FIFA U20 World Cup. There is a corresponding event for women’s football called the FIFA U20 Women's World Cup that started in 2002.
Who were the recent FIFA U20 World Cup winners, runners-up, third & fourth placed teams? Where is the 2019 FIFA U20 World Cup? The 2019 FIFA U20 World Cup will be hosted by Poland. It will be the first time Poland have individually hosted a FIFA tournament after co-hosting the 2012 UEFA European Championship with Ukraine and hosting the 2012 UEFA European U21 Championship. When is the 2019 FIFA U20 World Cup? The 2019 FIFA U20 World Cup begins on 23 May 2019 with Tahiti vs Senegal at the Arena Lublin. The tournament concludes with the final which will be held on 15 June 2019 at the Stadion Miejski in Łódź. What cities and Stadiums will host matches at the 2019 FIFA U20 World Cup? Six cities in Poland will host matches including Bielsko-Biała (Stadion Miejski), Bydgoszcz (Zdzisław Krzyszkowiak Stadium), Gdynia (Stadion GOSiR), Łódź (Stadion Widzewa), Lublin (Arena Lublin) and Tychy (Stadion Miejski). There were 24 teams that qualified for the final tournament. 23 countries went through a qualification process with the final spot awarded to Poland who qualify automatically as host nation. The defending champions have to qualify in the various youth championships throughout the six confederations as outlined below. The 24 nations that qualified and will take part in the 2019 FIFA U20 World Cup are Argentina, Colombia, Ecuador, France, Honduras, Italy, Japan, Mali, Mexico, New Zealand, Nigeria, Norway, Panama, Poland, Portugal, Qatar, Saudi Arabia, Senegal, South Africa, South Korea, Tahiti, Ukraine, United States and Uruguay. We have everything you need to know about all 24 teams including how they qualified, history, best performances and manager. The squad for each nation have yet to be released. France are the early favourites followed by Argentina, Portugal, Italy, Uruguay, United States and Nigeria. The 24 teams were drawn into six groups of four teams. Each team will play against the other three teams in their group with the top two teams in each group and the four best third-placed teams advancing to the round of 16. The knockout rounds begin in the round of 16 followed by the quarter-finals, semi-finals, third place match and final. Check out the full list of the fixtures to make sure you don’t miss a minute of the action. The 2019 FIFA U20 World Cup Final will be held on 15 June 2019 at the Stadion Miejski in Łódź. Who has won the most FIFA U20 World Cup titles? Ten different nations have won the U-20 World Cup with 36 nations reaching at least the semi-finals of the tournament. Argentina are the most successful nation having won the FIFA U20 World Cup on six occasions (1979, 1995, 1997, 2001, 2005, 2007). South American rivals Brazil are next best with five wins (1983, 1985, 1993, 2003, 2011) and also hold the unwanted record of being the nation that have been runners-up a record four times (1991, 1995, 2009, 2015). Portugal (1989, 1991) and Serbia (1987, 2015) have both won the U20 World Cup twice, six nations winning once including Ghana (2009), Spain (1999), Soviet Union (1977), West Germany (1981), England (2017) and France (2013). Brazil have the most appearances at the U20 World Cup, taking part in 18 tournaments and also hold the record for the most consecutive tournaments at 16 between 1981 and 2011. Breaking down the U20 World Cup titles by confederations, CONMEBOL (South America) has the most with eleven titles, UEFA (Europe) have won nine titles and CAF (Africa) won once after Ghana emerged victorious in 2009. Teams from the AFC (Asia) and CONCACAF (North America, Central America, Caribbean) have made the U20 World Cup final on three occasions but fell at the final hurdle against nations from Europe (UEFA). A team from every confederation has made the U20 World Cup final except the OFC (Oceania). The best performances from teams in the OFC member were Australia who reached the semi-finals in 1991 and 1993. Australia are no longer a member of the OFC having joined the AFC in 2006.
Who are the defending FIFA U20 World Cup champions? England are the defending champions having won the 2017 FIFA U20 World Cup in South Korea. Managed by Paul Simpson, England got topped Group A which included South Korea, Argentina and Guinea. The Three Lions then defeated Costa Rica 2-1 in the round of 16, Mexico 1-0 in the quarter-finals, Italy 3-1 in the semi-finals before beating Venezuela 1-0 in the final. 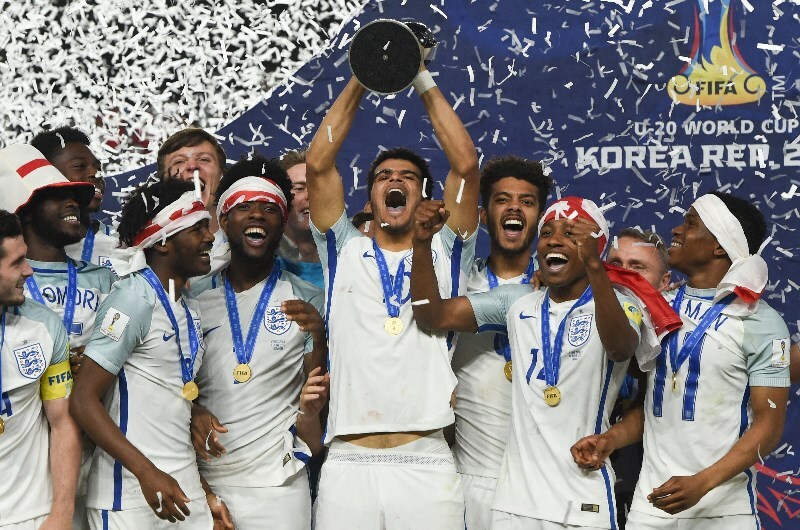 The 2017 FIFA U20 World Cup Final was held at the Suwon World Cup Stadium on 11 June 2017 with Dominic Calvert-Lewin scoring the winner. England had two players win best player awards, Dominic Solanke scoring four goals to earn the Golden Ball award and goalkeeper Freddie Woodman awarded the Golden Glove award. England won't defend their title after losing 3-–0 to Norway in a play-off for the final qualifying place at the 2018 UEFA European Under-19 Championship in Finland. England are the sixth consecutive champions to have failed to qualify for the subsequent U20 World Cup. Players from Argentina feature prominently on the FIFA U20 World Cup top 10 goalscorer list. Javier Saviola tops the list with 11 goals at the 2001 FIFA U20 World Cup hosted in Argentina. Brazil’s Adailton is next best after scoring 10 goals in the 1997 Malaysia FIFA U20 World Cup. Argentina’s Ramon Diaz scored eight goals in 1979 with his teammate Maradona second best at the tournament with six goals. Ghana’s Dominic Adiyiah also scored eight goals in 2009 with two players scoring seven each, Germany’s Marcel Witeczek in 1987 and Spain’s Etxeberria in 1995. The Golden Boot is an award for the top goalscorer at the U20 World Cup. If more than one player scores the same amount of goals, the player with most assists wins the award. Some of the most outstanding players in recent history have won the golden boot, silver boot or bronze boot since the U-20 World Cup began in 1977. These include Diego Maradona, Davor Suker, David Trezeguet, Adriano, Lionel Messi and Sergio Agüero. The winner of the Adidas Golden Ball is selected by the media, with the award presented to the player who is judged to have played the most outstanding football during the tournament. Since 2007 the runners-up receive the Silver Ball and Bronze Ball awards. Some of the previous winners of the Adidas Golden Ball at the U-20 World Cup include Diego Maradona (1979), Lionel Messi (2005), Sergio Aguero (2007) and Paul Pogba (2013). The Golden Gloves Award began in 2009 and is awarded to the player judged to have been the best goalkeeper of the tournament. The first winner was Costa Rica’s Esteban Alvarado, followed by Portugal’s Mika (2011), Uruguay’s Guillermo de Amores (2013), Serbia’sPredrag Rajković (2015) and England’s Freddie Woodman in 2017. There is plenty of value betting on the U20 World Cup with many players not yet household names or playing for big clubs. Establishing which players and teams are in form is crucial to having a successful tournament. There should be significant emphasis placed on the first round where each nation play for the first time. Friendly matches can also provide clues as to which teams are likely to do well. We will have a range of betting tips for the 2019 FIFA U20 World Cup including tournament winner, top scorer and individual match tips including match result, handicaps, total goals over/under and correct score tips. France are the early favourites to win the 2019 FIFA U20 World Cup followed by Argentina, Portugal, Italy, Uruguay, United States and Nigeria. Odds correct as of 9 April 2019. There are a number of ways to watch the tournament by live streaming. FOX Sports Go will offer the matches on their website and app to authorised users with Eurosport the broadcast right holders in the UK. Canadian fans can watch the 2019 FIFA U20 World Cup on TSN GO in English and RDS GO in French. SBS will broadcast all matches in Australia on the internet and mobile. Live Streaming is free of charge for bet365 account holders with a funded Sports account or have placed a bet within the last 24 hours. Live Streaming at bet365 is available on desktop, mobile and tablet. A number of bookmakers will be offering free bets during the U20 World Cup, be sure to check in with free tips for all the latest offers. Free Tips will have a bet of the day for each matchday during the 2019 FIFA U20 World Cup. These could include win/draw/win, first goalscorer, -1 and -2 handicaps, over 2.5 goals. It’s important to know all the results during the tournament. In order to accurately predict what’s likely to happen in the upcoming games, information such as statistics, team selections, goal scorers and assist makers is vital. The official FIFA website has all the results information you will need throughout the 2019 FIFA U20 World Cup. Watcjing replays are essential if you want to have an edge against the bookmakers and have a successful betting tournament. Finding value in various markets can be found by watching replays to see which players might be flying under the radar and are ready to start scoring in upcoming matches. The FIFATV YouTube channel is a great way to catch up and make sure you don’t miss any of the action from the U20 World Cup. The official FIFA website has all the news you will need before and during the tournament. Player interviews, manager interviews and insight can often make the difference and help you build your bankroll at the U20 World Cup. Follow the following accounts to make sure you don't miss any of the important information, interviews and images from the tournament.